“The last Princess von Metternich called this cellar ‘The Cathedral of Riesling,’” my guide said. It was easy to see why. The gravel on the floor, strewn there to capture humidity, crunched underfoot, as though the wines in the ancient casks were applauding our every step. The cellar was really nothing special, as far as European castle wine cellars go, though it was artfully lit to suggest the cathedral analogy, the light reflecting through the flutes of sparkling Riesling sekt we carried as votives. Nothing special, that is, except for its location, at Schloss Johannisberg in Germany’s Rheingau region. A visit to Schloss Johannisberg is a necessary pilgrimage for any Riesling lover. Not because of the wines, though they are great, but because of the history, and the geography. 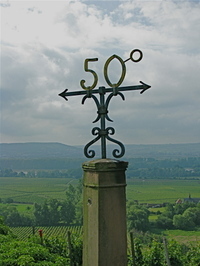 The 50th parallel bisects the vineyards, marking Europe’s northernmost wine region. 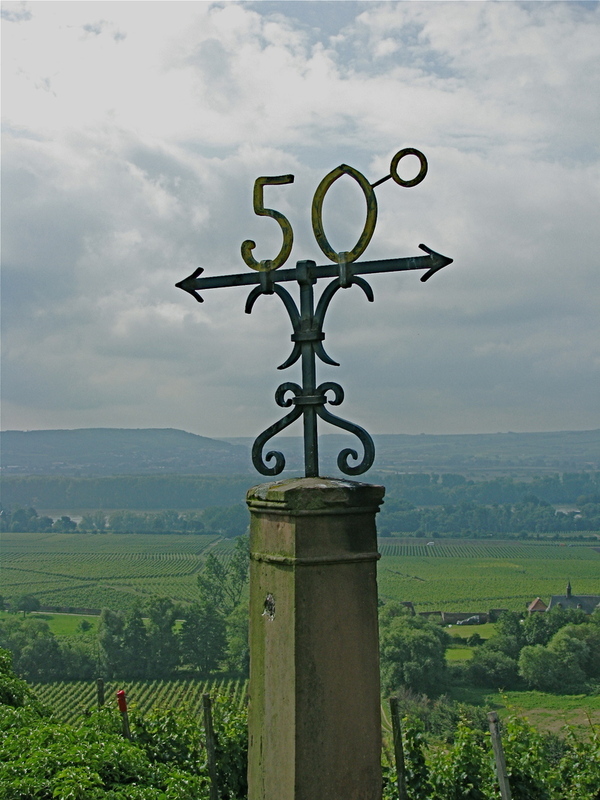 The estate, above the small town of the same name where the Rhine flows east-to-west for a short stretch, combines religious, diplomatic, and viticultural history. The schloss, or castle, began as a monastery built in the early 12th century, though more recent excavations found Romanesque attributes that have been featured in the current restoration. The castle itself was finished in 1728, but destroyed in World War II by an errant Allied bomb. 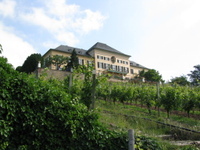 The estate, which is now about 80 acres, was planted to Riesling in the 1740s by the Prince of Fulda. This nobleman, or at least his tardy messenger, was responsible for German wine as we know it - one year, when the official decree to begin harvest arrived late, the nervous vineyard workers were forced to make wine from moldy grapes, and botrytis, or noble rot, was discovered. This was the beginning of spätlese, auslese and trockenbeerenauslese, the progressively sweet wines mimicked the world over as late harvest. Schloss Johannisberg changed hands several times during the Napoleonic Wars, eventually coming under control of the Hapsburgs. The Emperor of Austria awarded it to Prince von Metternich for his work at the Congress of Vienna, which restored European order after Napoleon’s defeat. The estate remained in the Metternich family until the last prince passed away two years ago. 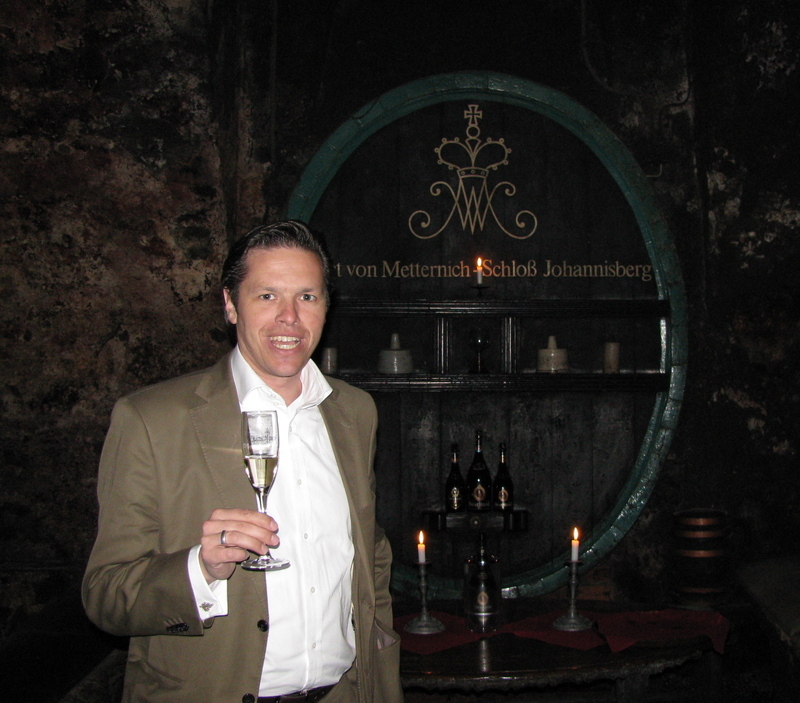 My guide on this tour was Christian Witte, the estate’s young and ambitious managing director. He spoke brashly of restoring Schloss Johannisberg’s wines to the status they enjoyed before the First World War, when they were priced comparably to the first growths of Bordeaux. The company actually has two wineries, the Schloss and G.H. von Mumm, located nearby. The Mumm label (not to be confused with the better-known Champagne house) produces red wines and trockens, the trendy dry style of white wines. The Schloss sticks to the traditional styled wines. “Tradition is not praying to the ashes, it is handing over the fire,” Witte said, practicing his marketing mantra. 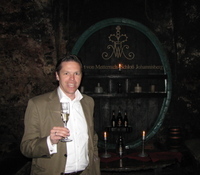 He acknowledged that rebuilding the estate’s reputation will be difficult given the consumer’s difficulty in deciphering Riesling in general and German wines in particular. To prove his point, Witte offered a dizzying array of wines, all showing tremendous Riesling character but with significant differences in sweetness and fruit expression. Trying to keep up, my notes are a jumble of references to “red label,” “green label,” or silver, “long cap” and “erstes gewächs,” one of Germany’s attempts to emulate the first growth concept. These are interspersed with adjectives such as “zesty” and “mineral,” plus frequent superlatives. Finally, I put my pen down and concentrated on the wines. Tradition, ambition, castles and cathedrals faded from my mind as I stared into the fiery glint of Riesling in my glass. Photos by Dave McIntyre: Schloss Johannisberg; the 50th Parallel; Christian Witte in the Cathedral of Riesling. I have a Beef with Riesling! Can Riesling carry a meal? On a recent tour of Germany’s top wine regions, I found myself in Bacharach, in the heart of Mittelrhein, where nearly every promontory overlooking the storied Rhine River boasts a castle, and those that don’t have castles have vineyards, strikingly beautiful vineyards on impossible slopes of up to 70 degrees, their vinerows ascending the mountains rather than crossing them in order to capture sunlight evenly on both sides. Bacharach lies right along the river, as several small towns do. It has a train station, a few churches, stores offering wines and cuckoo clocks, and of course a castle up the hillside overlooking town. Most importantly for wine lovers, Bacharach has Weingut J. Ratzenberger – and the Rhein Hotel, home of Stübers Restaurant and chef Andreas Stüber. Jochen Ratzenberger’s winery on the edge of town is built into the hill that grows his vines, the cellars dug 40 meters deep into the hill to keep the wines naturally cool. He took us to the top of these slopes to show us the slate terroir that gives his Rieslings the delicate minerality characteristic of the Mittelrhein. As he explained how the south-facing slopes capture the northern sunlight, church bells rung out from the town below us, their song cascading from the hillsides to the east and west, celebrating nothing in particular (it wasn’t even the hour) except perhaps life itself. And maybe Riesling. Or perhaps these were dinner bells. At Stüber Restaurant, I ordered the house specialty, Rieslingbräten – a pot roast essentially, marinated for three days in Riesling, mustard, and some other stuff I never quite got clear despite several entreaties to the chef. (He gave me a postcard with a cartoon that roughly describes how the dish is made – it’s that popular.) The meat is then braised with onions in a 150-degree Celsius oven for three hours. Served with its buttery sauce and a mound of spätzle noodles, it was sheer comfort food. Cooked in Riesling, it of course called for Riesling to wash it down. I gulped the J. Ratzenberger 2005 Steeger St. Jost Grosses Gewächs, which fermented for 11 months and featured yeasty apricot and slate flavors, as well as the 2007 Steeger St. Jost Halbtrocken, more delicate and flowery, with even a hint of lavender, very characteristic of the Mittelrhein. But my favorite with the beef was the weightier 2007 Bacharacher Wolfshöhle Spätlese, which offered apricot, pear, and acacia honey with a mineral oil texture and a long, lovely finish. I never once looked around for a red wine. Back home, the memory of this meal – which ended in the restaurant kitchen watching Germany defeat Austria in the European soccer qualifying round – has me digging my spätzle maker out of the closet and searching for Rieslings in the wine stores.